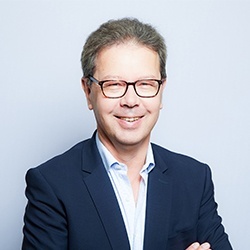 Jean-Michel is a Managing Director at StratX. He ensures that the company and team remain at the cutting edge in terms of management development for creating and delivering great learning experiences for our clients. With a passion for developing people and a collaborative nature, Jean-Michael has helped nurture and build the trust of our clients by fostering long-term relationships, helping them achieve success by truly understanding their needs. He likes to focus on providing the “wow” effect, by delivering extremely engaging experiences, making sure that learning outcomes stick, and guaranteeing a measurable impact with results. Before joining StratX, he was the managing director of a leading automotive company, and was also a board adviser for strategy, corporate development and business performance to a world leader in metallurgy. He started his career as a project manager at a major player in the aerospace sector. Jean-Michel is an avid fencer and has practiced the sport for years. Though he loves humor and not taking things too seriously, he also appreciates drama and enjoys catching a great play at the theater.